June | 2015 | WE BIKE, etc. Started our day at the campground at Spring Green- everything was pretty wet after the storms that came through the night before. Also the mosquitoes were terrible and were eating Tracy to death. We finally had to take our bike and all our gear to a shelter and finish packing – Tracy could not take it anymore!! We finished packing up and eating breakfast and then headed out for the day. We did not start the stove so decided to stop in town for a cup of coffer and tea. While seating in the gas station five cyclists from the quad cities came in. They were staying in the area and taking day trip loops on their bicycles. They said they just loved the area and the roads were great – we could not agree with them more. On we go to tour the Spring Green Preserve where the only cactus native to Wisconsin grows. The Preserve is located just north of Spring Green and is worth a stop. Very interesting and I am sure a great view from the top of the Preserve, we did not hike to the top but heard from a local it is worth the hike. We then headed over to Hwy 14 to cross the Wisconsin River again because we were going to travel on the south side of the river today to Arena, Mazomanie and on to the Merrimac Ferry. We stopped in Mazomanie at a new café – the Base Camp Café, for a snack and to make a phone call to Cassandra Duvall from NBC26 Wisconsin Tonight for a phone interview to air that evening. 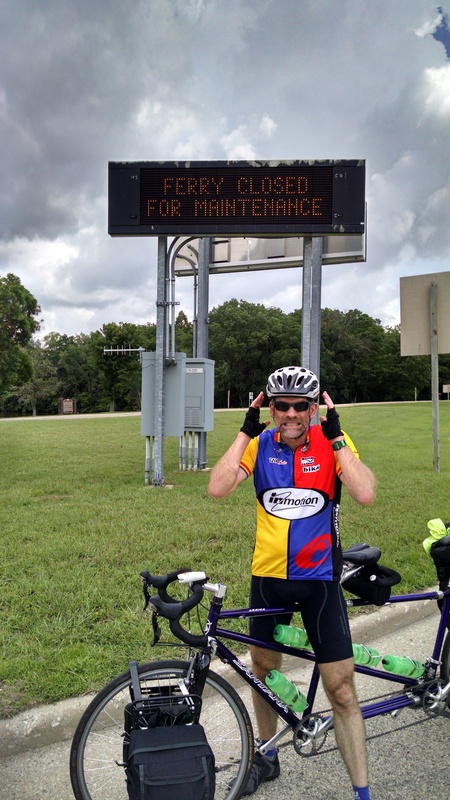 We then took off towards Merrimac to take the ferry across, we finally got there and there was an electronic sign saying the ferry was closed for maintenance – oh crap!! It would be an extra 20- 30 miles to get across the river to Portage. But then the sign flashed to the next message which said from 9:00am – noon – it was 1:30pm we were in business – thank goodness. So on the ferry we went for our very short journey across – it seemed like we just got on and were already to the other side. Did you know the ferry actually travels along a set of cables in the water? Well it does. After exiting the ferry we headed towards Portage on Hwy U – a great ride little or no traffic and great views of the river and rolling farmland. Although there were many tough to moderate climbs – I guess that comes with the great views. At one point Tracy said this has to be the top there is a cell tower up here and I don’t think we can go much higher. But around the corner we climbed again. Tracy also pointed out we had to get back down to river to cross into Portage and we better start dropping soon or it will be straight down!! Finally we had a gradual drop to Hwy 33 to cross the river into Portage. This time thru Portage we got to check out the downtown area more – they have a beautiful downtown but it had lots of traffic because we were going thru during afternoon rush hour. We made it to our hotel and had time to do a load of laundry and relax a bit before our long day tomorrow when head to Fond du Lac. 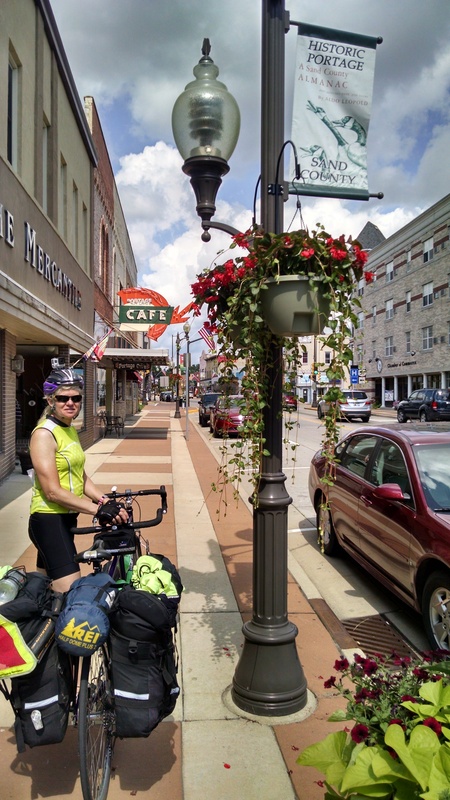 Yesterday afternoon we hopped on the bike and pedaled into Prairie du Chien to further check out the area. It is a very nice community and has some great views of the mighty Mississippi and Wisconsin Rivers. The downtown is looking pretty good and has some new stores as well as some old ones that have been there for ever – including the famous Pete’s which is a small hamburger stand which has been there for 109 years. It was amazing to see the lines to get a hamburger. That is all they serve and people will wait in lines for hours to get one. We met a gentleman that morning who told us about Pete’s he said people come from all over to try them. Ever year he has to make sure he gets his Pete’s fix!! We did not try one but probably should have because the line was actually pretty short when we went by and then we could say we had a Pete’s burger. On another note I forgot to mention yesterday – Mary Antoine from the Fort Crawford Museum (she gave us the great tour yesterday) son (Matt) was a bronze medalist in Skeleton in the winter Olympics in Russia – really cool. He is training now and hopes to get back to the next winter Olympics. For those of you who are not familiar with Skeleton it basically is athletes sliding downhill on a sled face down at a very high rate of speed. Sounds scary to me!! Matt became interested in Skeleton after watching the Salt Lake City Olympics in 2002, even after being cut after his first tryout for the team his interest was not killed. Twelve years later his dream came true and included an Olympic medal. Today we got up early had breakfast and planned to leave by 7:00am but the first wave of the storm came thru and we decided to ride it out at the hotel and leave after. An hour later we were able to get on the bike. If we kept cruising we thought we would be able to stay ahead of the second wave of the storm – it worked pretty well. For our ride back to Spring Green we traveled on the south side of the Wisconsin River – we came down on the north side mainly highway 60. The south side was a much nicer ride than the north side. The roads were less busy and had paved shoulders most of the way. The first part of the ride was on County Hwy C it was beautiful but it had a major climb about 5 miles in (near Millville). But I am glad to report we made it over the top. We traveled Hwy 133 for the rest of the ride on the south side of the river – it was a great road low volume traffic with a nice wide shoulder. The whole ride we were just ahead of the storm – although we did get wet several times when the front edge of the storm caught up with us. But never had a through soaking thank goodness. When we left in the morning the weather man said 90% chance of rain and some severe storms – we really lucked out with the weather – it could have been an all-day soaking!! We had no stops scheduled for today so we did not have to get anywhere at any particular time which was nice. We really cruised on the bicycle today to try and stay ahead of the storm – which we were able to do and are now in Spring Green for another night of camping at the Wisconsin Riverside Resort a really nice campground located right on the Wisconsin River. Have a great video of crossing the Wisconsin River and going over the top of the hill on County C I will try again later to post them. We got up early because Tracy looked at her Fitbit without her glasses and thought it was 6:30am when it was really 5:30am ouch!! We packed up anyway and headed to Prairie du Chien – 11 miles away. When we started it was quite foggy, luckily we had our head and tail lights thanks to J B Cycle and Sport. We then headed to the hotel for a much needed shower and a nap. Please enjoy the attached videos from the past several days. I will put up some pictures soon. Tomorrow we begin our return trip to Green Bay and it is suppose to rain all day – hopefully not but if so we will just get wet!! Today was a day with no scheduled visits so we could leave a little later from the campground – yea I got to sleep in a bit. Everything was soaking wet when we got up so we spent a little extra time drying things out and doing a load of laundry. Our trip was pretty uneventful, although we met a couple who were bicycling around the state and were on their last day out and heading back to Prairie du Chien. They had been bicycling for the last two weeks and seemed to be totally enjoying themselves. They were from Texas. We also had a young woman from Texas stop in her car when we were talking with them at the Wayside. She had ridden across the country several years ago and stopped to see where we were all going and to exchange stories. We probably spent a half hour talking with everyone – it was great to hear all the different stories. We all agreed the acts of kindness you experience when you are bicycling are truly amazing and restore your faith in human kind. We are staying in Wyalusing State Park near Prairie du Chien. If you have never been to this state park it is definitely worth it for the views to the Mississippi and Wisconsin rivers alone. The park sits up high on a bluff and provides amazing views. Although it is truly a tough climb for a bicyclist – we made it but it was a challenge and was pretty much a straight up climb – but definitely worth it. Our stay at the state park was made possible by a John Moore a Park Ranger who Peter had trained recently. He was part of a class at Harrington Beach State Park and Peter got to know him. We were not able to reserve a site so Peter contacted John who told him he would make sure we had somewhere to stay when we got here. True to his words he had a site ready for us upon arrival – thanks much!! I am cutting this short today another storm is rolling in and I want to make sure I get this out. More tomorrow. Also we get some pictures and videos up tomorrow – so check back. This morning we started at Riverside Park in Berlin and while eating breakfast our campground neighbor came over to visit and ask about our trip. He was a minister from Green Lake and a very nice man. We enjoyed visiting with him, it was a nice way to start the day. We then headed to Princeton to meet up with Jerry Disterhaft from Fox of the River Voyager Canoe. He met us in town in his full Jean Paul Pauquette costume – very cool!! He showed us the canoe and explained what they do on their trips and the history of his family and the area. The Voyager canoe trips sound like lots of fun and I am sure Jerry and his partner Glen do a great job of not only explaining the history but bringing it to life. We then went to breakfast with Jerry and had a great meal at the Blu Café in Princeton – Jerry even treated – thanks Jerry. With full bellies we headed off on our 16 mile ride to Montello to meet with Kathleen McGwin a freelance writer who is also a member of the Montello Preservation Society and Marquette County Historical Society. We met Kathleen at the Granite Quarry and she provided us with a brief history of the quarry. I bet you didn’t know that the quarry has the hardest granite in the United States and has been used for some amazing projects throughout the world. She has even coauthored a book about the quarry and graciously is giving us a signed copy – we can’t wait to get home to read it. We then bicycled down the road – County F to John Muir’s boyhood home – Kathleen who is an expert on John Muir was a great tour guide and was able to share lots of unique information on John Muir. The area also has seven different John Muir historical sites to visit. If you are a John Muir fan or just want to learn more about him then the Montello area is where you need to go. Our day and tours were not over yet – down the road to Portage. The ride to Portage was great – quiet country roads with little or no traffic. We arrived in town with time to spare before our tour of the Historic Indian Agency House. It allowed us to get a snack and then head out to the House. Our guide for this facility was Jane an avid bicyclist. She goes on frequent rides with the local bicycle club and lots of rides around the Portage area. She told us about the Columbia County Bicycle Loops with three of the loops going thru or starting in Portage. The loops are numbered with a total of fourteen loops in the county with distances of 12 – 34 miles. 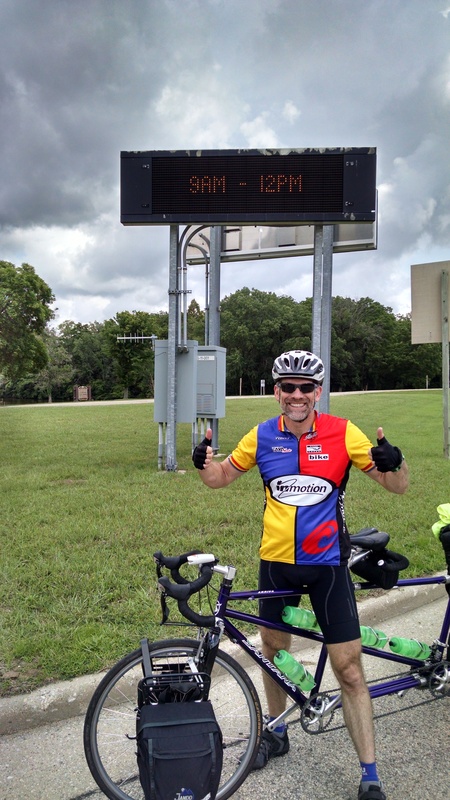 We saw the signs along the road on our way in on County F. What a great idea to encourage people to get out and take a ride – way to go Columbia County Silent Sports Trail Committee. Later that evening we met with Mayor Bill Tierney and his wife Val for a tour of the Portage Canal and the Waunona Trail project. The trail is located adjacent to the Portage Canal and was a busy place when we were there. Work will hopefully continue on Phase two and three to extend the trail and clean up the canal. It is a huge project but it will be amazing when it is done. After a busy day we will happy to get back to the hotel and relax for a while!! Sorry I did not get this out sooner – by the time we got back to the hotel I was pooped and just wanted to go to bed. Then the next day we had no connectivity in Spring Green – so two days without a blog. Hopefully I am back on track now. Started our day in Portage with a nice breakfast at our hotel. We then bicycled 10 miles down Levee Road – very cool road to the Aldo Leopold Foundation office and Shack. We met with Jennifer Kobylecky, Executive Coordination for the foundation. She provided us with an overview and history of the foundation and the Shack. We then traveled out to the shack for a self-guided tour. Aldo Leopold was an amazing man and author of the Sand County Almanac. Go out to www.aldolepold.org for more information on this amazing man and this beautiful property. After our visit with Jennifer we bicycled the mile down the road to tour the shack and the adjacent property. Amazing trees and prairie flowers on the property. Definitely worth the trip. We then hopped back on the bicycle and back down Levee Road – a great road to bicycle on saw lots of other cyclists. Off to Prairie du Sac and Sauk City. The route took us to the Sauk Prairie Recreation area and Devils Lake. The ride was a hilly one and tested our bicycling legs a bit!! But a beautiful area with great views. We got to Prairie du Sac early for our meeting with Jody from the Tripp Museum so we had lunch at Ques Bar and River Deck – great food with a deck that has a view of the Wisconsin River. Scott the owner was a great guy and told us about the new trail that will be coming in just out his back door. They will be pulling the railroad tracks this fall and then placing the trail surface in the spring of 2016. It will be an amazing asset to the city and his business. Trails definitely bring people to a community. After lunch we headed back to the Tripp Museum to meet with Jody. They have a beautiful building and the exhibits are well done and very easy to go through and just enjoy. Also have many different exhibits from an amazing bird exhibit to a diorama from the Milwaukee Public Museum. Jody was a gracious hostess and we had the pleasure of meeting her husband Jack and two boys. She even made a strawberry and rhubarb pie to share with us – it was delicious. We spent a lot of time with Jody and her family to explore the museum and learn about the exhibits and projects to come. What a great place and an energetic and creative curator – you have to check it out. Jody also arranged for the local newspaper reporter – Kim to come and interview us – then Kim and her significant other Bob went out on our route to take some pictures as we went by. Very nice people and a pleasure to meet. We were finally done with our interviews for the day and needed to hightail it to Spring Green for the night at the Wisconsin Riverside Resort – it is a nice campground with all the extras located right on the Wisconsin River. Besides the terrible storm that came thru in the early evening we enjoyed our stay at the campground. Started our day with a beautiful view out of the Lock Tenders House in Little Chute and to the sounds of water rushing over the dam. After breakfast we headed to Appleton to meet with Laura Leimer and her husband to tour the Vulcan Replica – due to the bad weather yesterday we had to reschedule the tour. The Vulcan Replica is basically a hydroelectric central station which gets it’s power from a water wheel operating under a 10 foot fall of water. The building also houses the original Edison “K” dynamo and was designated as a National Historic Civil, Mechanical and Electrical Engineering Landmark in 1977. They hope to open the building to the public for tours in the near future. We highly recommend you check it out. Appleton also has several other historical facilities including Paper Discovery Center, Hearthstone Heritage Museum, History Museum at the Castle and Vulcan Park. All worth a stop. We then bicycled over to the Trestle Trail in Neenah/Menasha and traveled along the beautiful trail. Were amazed at the number of people on the trail on a Tuesday morning – so good to see. The City of Oshkosh was our next stop. We traveled to the Paine Art Museum and Tracy enjoyed looking at the clothing exhibits. The Oshkosh Public Museum is right across the street so it is easy to hit them both in one day. We then went to lunch at Fratello’s a great restaurant located right on the Fox River. We were very hungry so a good lunch was much appreciated. We even met the owner a very nice man who stopped to ask about our bicycle and our trip while we were packing up and getting ready to go outside the restaurant. After lunch we had enough energy to head out to Omro which has a great historic walking tour in the community featuring over 40 buildings – we did not have time for the tour but have heard it is worth the stop – to get their brochure click on the link. Also traveled past Scott Park a beautiful park located adjacent to the river. On to Eureka to see the lock and then on to Berlin for camping at Riverside Park. Had several acts of kindness today – first one was to be met at the Eureka Lock for a personal tour from Barry Rogers from Green Lake Greenways. He gave us a great tour and history of the lock and then bicycled with us to Berlin and our meeting with the Tony the reporter for the local Berlin Newspaper and Laurie Petree and her husband Paul from Green Lake Greenways. After the interview Laurie and Paul met us at our campground and then drove us to the local pool for a much needed shower. Oh yea, Barry set it up for us to be able to take a shower and even paid our fee – Thanks, Barry. Then Laurie and Paul took us out to dinner with Jerry from Fox of the River Voyager Canoe LLC. We will be meeting with Jerry to learn more about his business and see his really big canoe tomorrow – more information to come. We ended the night with a drive back to the campground from Laurie and Paul. Laurie even gave us a goodie bag – yum!!. Thanks for everything – much appreciated. Oh yea we had our first fan sighting a young man from Berlin came up to us at the pool and said are you the people I saw I on the news – we said yes and he said too cool Welcome to Berlin. Weather: Humid and 75 degrees at the start of the trip, torrential rain, thunder and lightening middle of ride and cooler and windy later in the day. We got it all. We started our day early with Channel 5 TV. Elsa Robins and cameraman Mark Finney showed up at our house at 5:30am to set up and get some live spots for the early morning news. Thanks to channel five for their coverage. We then head up to Bay Beach Amusement Park for our 8:30am Press Conference. I believe all the local stations were there for the start of the trip and even took some video as we passed on the trail. 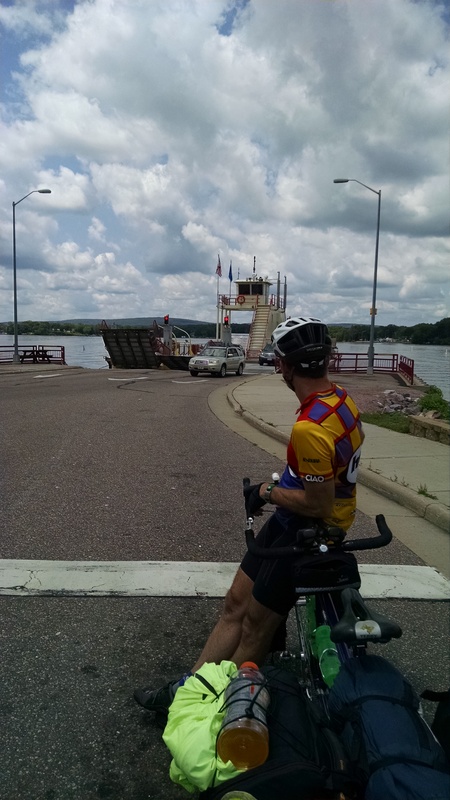 Our friend Quentin Gniot biked with us down to Wrightstown and then headed back to Green Bay. We all got pretty soaked on the way to Wrightstown, Quentin then headed back to Green Bay hopefully he found somewhere to wait out the storm. Peter and I took shelter for a bit at a gas station in Wrightstown and then headed over to the Village Hall and ended up spending about a hour and a half at the Wrightstown Village Hall waiting our the storm. Steve Johnson the Village Administrator and Police Chief Perry Kingsbury were great hosts – thanks guys. Along the route before the storm hit we traveled by the National Railroad Museum in Ashwaubenon, Hazelwood in Green Bay and Heritage Hill Historical State Park in Allouez. All are very nice family oriented attractions, that provide history of the area. We also were able to stop at several of our sponsors along the way – LinLiebmann Attorneys at Law, Forsite Benefits and Flow Yoga Studio. 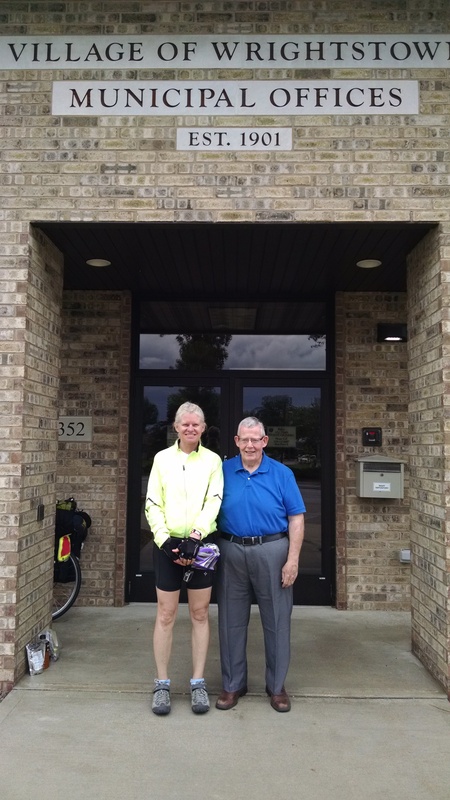 After the storm passed we jumped back on the bicycle and headed to Kaukauna and the 1000 Islands Environmental Center and got a tour from John Moyles. If you have not been to 1000 Islands, you should check it out, they have some great exhibits to view. We also checked out Hydro Park in Kaukauna- I bet you did not know that due to the extreme drop of the Fox River in Kaukauna they have five locks in their community. Then on to Little Chute and the Heritage Parkway Trail – a great bicycling facility between the Fox River and lock system they are currently restoring. We then got to check out the Little Chute Windmill – very cool!! Then it was on to the Lock Tenders House our home for the night. Plans were to head to Appleton for a tour of the Vulcan Replica but the bad weather kept us in Little Chute and a reschedule for Tuesday morning. More about the Vulcan Replica to come!! Peter and I will begin our first trip of the year on June 22nd. We will begin at the Bay Beach Pavilion at Bay Beach in Green Bay with a press conference at 8:30 a.m. If you are in the area stop up to send us off. Plans are to spend the next ten days bicycling along the Fox and Wisconsin rivers to Prairie du Chien and back. The total estimated distance is 600 miles. We are excited to be stopping to visit many of the Fox Wisconsin Heritage Parkway partners and tour their properties. Follow along to hear all about some really cool places to visit right here in Wisconsin!! We had such a great time on our cross country trip last year we decided to continue our bicycle adventures in 2015. 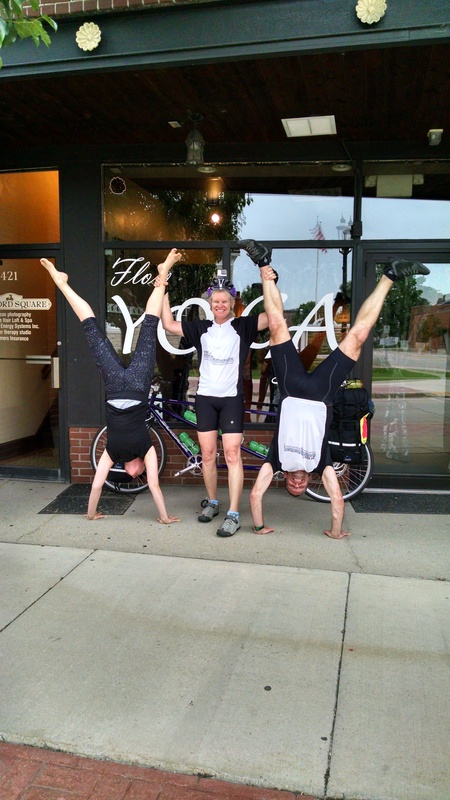 Our trips fill the education/encouragement component of WE BIKE, etc. We were amazed to have 6,000 people following our trip last summer and surprised at the number of people who used our trip to motivate them to get active. Looking for a new provider try one of ours they have been great partners for many years!! Plans are to continue to blog daily on our trip – I hope you will follow us again this year. The press release about our trip follows- just FYI. For their first trip, June 22 – July 1, the Fluckes are partnering with the Fox-Wisconsin Heritage Parkway. 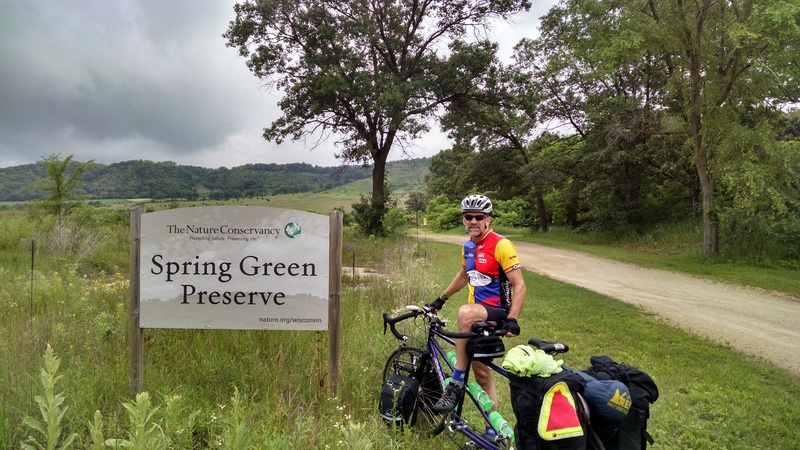 “The ride will be approximately 600 miles round trip from Green Bay, Wisconsin to Prairie du Chien, Wisconsin and will highlight the Parkway’s history, places of interest and partners, as well as “pioneering” a land – based route” said Peter Flucke. The trip will begin with a press conference at the Bay Beach Pavilion on June 22nd at 8:30am. Their trip itinerary will be released soon. The Flucke’s will blog and Facebook daily during their trips. During their 2014 cross country trip they had 6,000 organic followers.